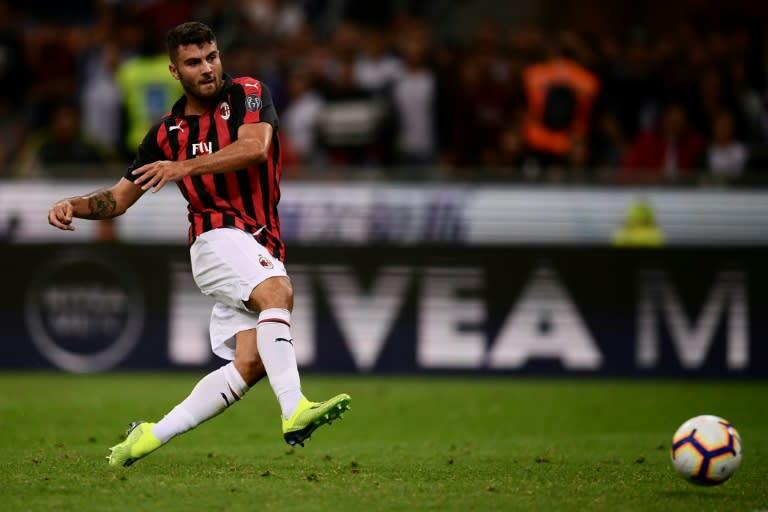 Substitute Patrick Cutrone scored a last-gasp winner to give AC Milan their first win of the season at their San Siro stadium with a 2-1 victory over Roma. Defender Federico Fazio had pulled Roma level 1-1 on the hour mark. Roma's World Cup winner Steven Nzonzi and AC Milan's Argentine striker Gonzalo Higuain both had goals disallowed. Both sides had been looking to put stuttering starts to the season behind them with Gennaro Gattuso's Milan losing 3-2 at Napoli last week despite leading by two goals. Milan's opening game against Genoa at the San Siro had been postponed because of the bridge disaster in the western port city. Nzonzi thought he had scored after a corner, but it was disallowed for a handling offence by the former Sevilla midfielder. But in a frantic finale Higuain found a way through for substitute Cutrone, who finished off to the delight of the 60,000 fans in Milan. Roma -- third in Serie A last season -- have just four points from three games and risk losing ground on champions Juventus and runners-up Napoli, who both have maximum six points from two games. Juventus play at Parma on Saturday with Cristiano Ronaldo looking to opening his scoring account in Serie A while Napoli play Sampdoria in Genoa on Sunday.